Disclosure: I received media tickets to this show in exchange for posting about it. As always my opinions are my own. The boys and I couldn’t be more excited it’s that time again to see all our Disney friends! 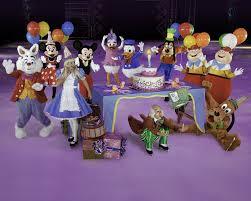 Disney on Ice presents Let’s Celebration is coming to town. Now, anything Disney the boys LOVE, but there is something magical about seeing your favorite characters performing amazing feats on ice. Last year was our first time experiencing Disney on Ice as a family and it was just as great as when I was a child myself seeing it through my six-year-old eyes! Don’t miss out on a show that is sure to excite the entire family, get your tickets today! It’s one colossal party on ice, with all your favorite Disney friends! Join Mickey Mouse and Minnie Mouse as they celebrate a Halloween haunt with the Disney Villains, a Very Merry Unbirthday Party with Alice and the Mad Hatter; Mardi Gras with Princess Tiana and Prince Naveen; a Royal Valentine’s Day Ball with the Disney Princesses; a Hawaiian luau with Lilo & Stitch; a winter wonderland with Woody, Jessie and Buzz Lightyear; and more in a magical medley of holidays, celebrations and festivals from around the globe. Come join the party when this spectacular ice show visits your hometown. Ticket Prices: Start as low as $15-$75. When you are ready to buy you ticket simply logon to Ticketmaster and make sure to use promo code GASSOUTH to get 20% off you tickets! Disclaimer: Save 20% on the face price of tickets, excluding fees. Good for all performances. Excludes Rinkside, VIP and Club seats. No double discounts. The boys and I would really love to see you at Disney on Ice presents Let’s Celebrate so we decided to do a giveaway! Enter below for your chance to win 4 tickets to either the Wednesday, October 9th or Thursday, October 10th show. To get your little ones excited about the adventure they are about to go on feel fee to print this Educational Game Sheet and have them complete the maze before you attend the show. I would love to see this show with my family. I went to see it with my cousins and grandmother in the 4th grade for the last time. I still recall how much fun that was. My most memorable childhood experience was going to see Bozo the Clown! He was in town and my mom surprised us with tickets. We did not have alot of money, my mom was a single mom with 5 little ones growing up so that was the ultimate trip for us. We felt privileged for a second! We sat very close and he asked to come on stage and made silly string come out of my ears! It’s was so cool! (Smiling just thinking about it) I still remember ever detail from that show! My most fondest memory, hmmm, I so many but one of my favorites was sitting on the porch with my cousins eating treats my Granny Goose made and laughing all evening waiting on our parents to arrive for pick up. My kids have never been to Disney on ice. This would be a great gift for them. One of My fondest childhood is when my mother took us to our first broadway show to see “Annie” It was so long ago but I remember it as if it were yesterday. I once saw a Disney on Ice show before. I think it’s Mulan? I loved it!